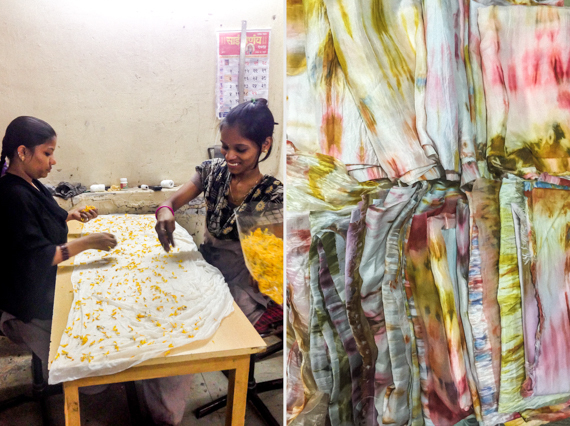 A natural dye workshop in Mumbai founded on practices of creative waste recycling. 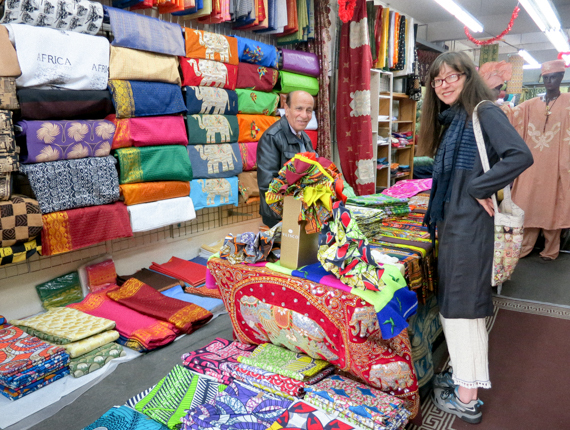 For the Temple Blessings project, temple floral waste is converted into natural dyes. In India, Hindu devotees offer gifts of flower garlands to invoke blessings of the deities. Wilted flowers are gathered every few days and discarded in water as per Hindu ritual. 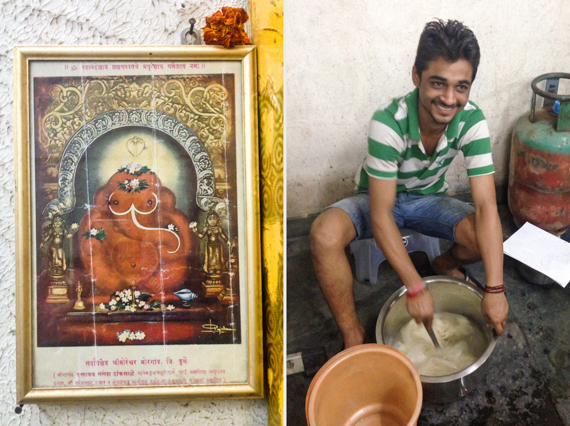 Twice a week, Adiv collects blessed temple offerings (nirmalya) from the Siddhivanayak Temple. Marigolds, roses, hibiscus, and coconut husks are collected, hand sorted, used to dye cloth, and eventually composted. The core of Adiv is its small workforce of young, self-taught artisans who come from challenging backgrounds. Techniques are learned through trial, error, and curiosity, with two Saturdays a month dedicated to experimentation. Workers keep a daily journal to ensure results can be replicated. 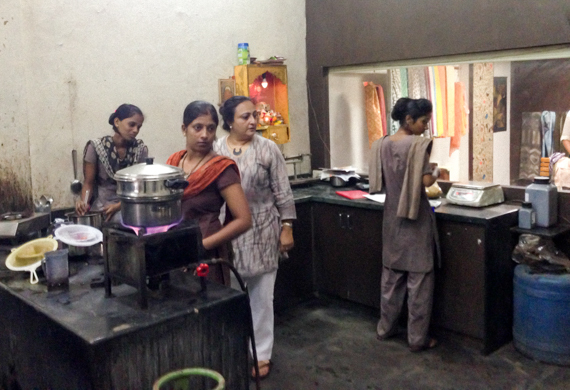 In 2006, Rupa Trivedi founded Adiv with just two pots in a kitchen. Today, it has grown to foster a group of 20 young men and women into skilled, steady income earners. Our collaboration with Adiv began in December 2014. Cloth common to Central and West Africa that is resist printed with geometric patterns or allegorical images in highly saturated colors. Genuine African wax cloth, also known as Dutch wax or Guaranteed English wax, is made using a roller-applied resin that produces telltale crackled markings and an equally vivid print on both sides. The cloth originated in Europe as a mass-produced imitation of hand drawn wax batiks from the Dutch East Indies (now Indonesia), reaching Africa’s Gold Coast in the late nineteenth century. Varied prints and color combinations communicate details about the wearer, such as age, social standing, or tribe affiliation. Design motifs are based on African proverbs and serve as cultural teaching tools. While production remains strong in Europe, design and marketing are controlled by Africans, usually through the matriarchs or so-called “Mama Benz,” who take pride in dictating patterns and acting as go-betweens for manufacturers and buyers. Fair trade manufacturer of handcrafted Bolivian knits made from native Andean fibers like alpaca and pima cotton. 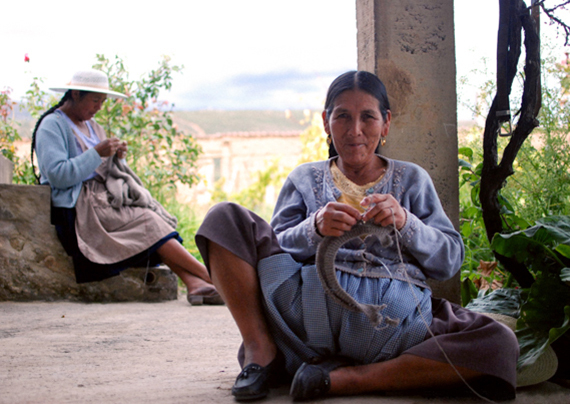 Since 2010, dosa’s handmade alpaca knits have been made by the skilled artisans employed by AHA Bolivia. Founder Anna Hosbein Aliaga started working with Bolivian artisans in 1994, and formally established the cooperative in 2005 in Cochabamba, Bolivia. The company is built on ethical and fair practices. It provides safe work environments, pays fair wages, and nurtures individual outside interests of its workers by providing financial support for continuing education classes and offering low interest rate micro-loans to any worker in need. 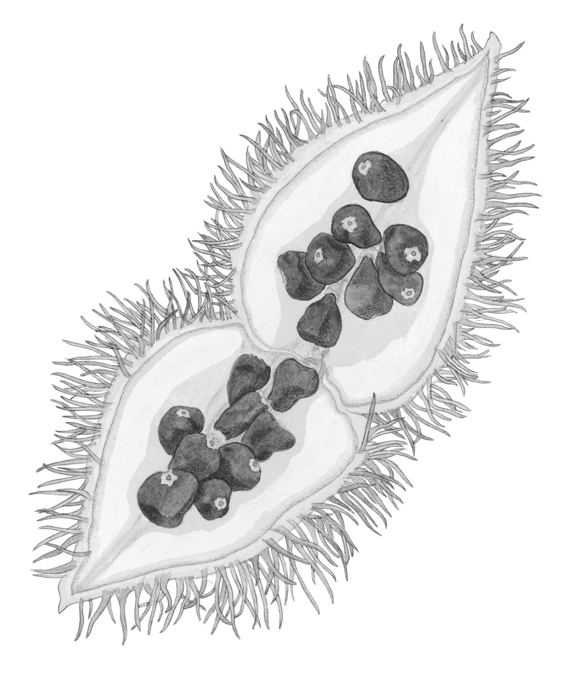 Seed derived from the achiote (Bixa orellana), a tree indigenous to the tropics of North and Latin America and grown in abundance in many parts of India. Annatto is a natural colorant that imparts a vibrant yellow to orange-red hue and requires no mordant when dyeing cloth. It is most commonly used in the food industry for color or flavoring, and is what gives cheddar cheese its familiar color. For our dye production in India, annatto is sourced from an ayurvedic supplier. Known as Sindhuri in Hindi, annatto powder is traditionally used as a natural cosmetic for making a bindi (dot) worn on the forehead, or for a sindooram, the red marking worn along the parting of a married woman’s hair to denote her marital status. A traditional Yoruban textile made of narrow, hand loomed cotton awe (strips) 10–20 cm (4–8 in.) wide that are arranged and sewn together into larger widths according to pattern. 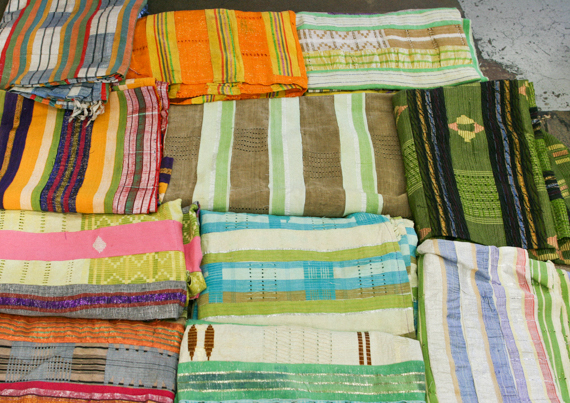 Ikat, openwork, and supplementary weft brocade techniques are used to incorporate color, texture, and woven designs, typically linear or striped. Those woven with floating wefts are most prized by the Yorubans. Origins of aso oke, or ”up-country cloth,” are unclear, but since the late 1800s its popularity and accessibility spread from royalty to the general population. Aso oke is worn with pride, reserved for major life occasions like weddings, naming ceremonies, and festivals. Aso oke is one of our most enduring textiles, first used in 1986 and revisited frequently, most notably in the fabrication of our popular luna bag. The luna bag’s simple construction allows us to use large pieces of aso oke fairly intact with limited intervention. We use a mix of vintage and contemporary textiles supplied by Zakari Nimaga from Gambia.